Most people start to tackle Income Taxes after the New Year. For some tax-related transactions, this is adequate. For others, it is too late. So there are indeed some Income Tax-related items you can shore up now, especially before Holiday Season kicks into high gear. The Tax Cuts and Jobs Act of 2017 was a sea change in the tax code. No matter what your political affiliations are, it is now the law of the land, so you should account for it in your finances. One rather simple thing to do is to us the IRS' Withholding Calculator, which you can access here. While the process is a bit cumbersome, the Withholding Calculator will provide you the necessary information you need to modify your W-4 with your employer. Assuming you have more exemptions, this will probably mean more take-home pay for you. If you leave your exemptions the same and your income is similar to what is was in 2017, you will likely have an Income Tax Refund. Some people view an Income Tax Refund as found money, others see it is an "Interest Free" loan to the government. Personally, I am non-committal about a refund...I'd rather see people save it, though I can understand how some could see it differently. That said, if you are behind on your saving - and you know if you are - give a thought to beefing up some part of your savings plan. For Charitable Donations to be "complete", they have to be done by the end of the Calendar Year. So if you are planning to make a rather large donation, you do have to do it by December 31st. Also, if you have unusually large realized income and want to consider ways to offset some of the income via charitable strategies, do it prior to New Year's. One by-product of the Tax Cuts and Jobs Act of 2017 is the planning strategy of "bunching" Charitable Contributions. To employ this tactic, you make several years' worth of contributions now to achieve a higher income tax deduction. In other years, you claim the standard deduction. Another planning strategy to consider is a Donor Advised Fund. Once used mostly by only high net worth folks, Donor Advised Funds are now valid planning tools for almost anyone donating money. To learn more about these strategies, please read this. 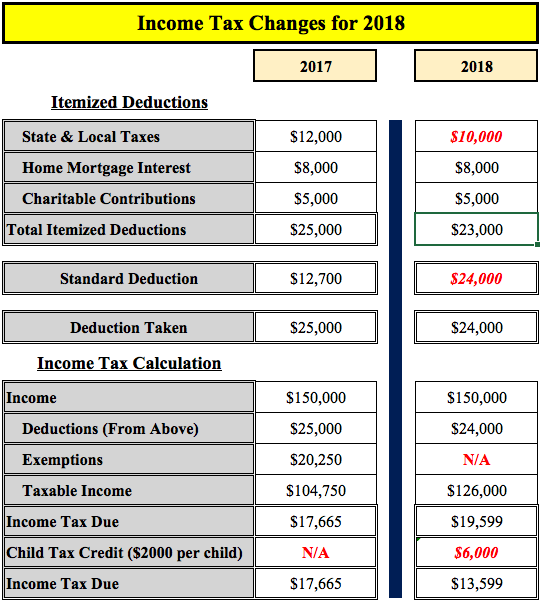 The deduction is usually tied to use of the state-sponsored plan, so be sure to check-out all the requirements to receive the deduction before counting your chickens. FSAs are a fantastic tool for addressing health care costs, which by any objective standard, are cumbersome. So make sure your FSA is funded up to your individual limit AND make sure you will have the medical expenses to match the contributions as money leftover in the plan typically is lost. While the realized savings may seem somewhat small, there are real savings to be had nonetheless. For those military members who qualify for a portion of their income to be "Income Tax Free" due to deployment to a designated combat zone, there are many financial planning opportunities to take advantage of this benefit. For those with Traditional IRAs (or their spouses) the double-dip of reduced Income Tax Rates and "Tax-Free" pay make converting Traditional IRAs to Roths particularly attractive. The income tax savings realized by using the combat zone exclusion will offset the income realized by the conversion. And even better, you will have the cash-in-hand to pay the tax bill. And best of all, you will enjoy Income Tax Free growth in the Roth IRA from now on. For those only participating in the Thrift Savings Plan (TSP), you may want to consider making all your contributions of the "Roth" type while you are in a Combat Zone. This tactic will allow a portion of your TSP to grow Income Tax free...a definite benefit to you. The Combat Exclusion is a tremendous benefit about which you should take full advantage. To learn more about SIMPLEs, please look here. SIMPLEs are a valuable planning tool for the self-employed as well as small business owners. Your SIMPLE IRA must be established by October 1st of the year in which you intend to make contributions. Thankfully, actual contributions can be made up until the entity's filing deadline, including extensions. So if you intend on using a SIMPLE, you need to get on this straight away! Not all investment commitments work-out well. For those ideas that did not succeed, you can realize capital losses for your Income Tax benefit. To do this, you have to realize the loss in the calendar year for which you file your income tax return. You can immediately offset up to $3,000 in losses against your income or offset other gains you may have had elsewhere in your portfolio. And, you can carry-forward unused losses and claim $3,000 per year until the entire loss is claimed. Please be aware of the "Wash Sale" rule which prohibits claiming a tax loss if you re-purchase the same security within 30 days. Consult a Tax Professional if you are unsure about what to do. For 2018, the tax treatment for UTMA Investment account changed significantly. Specifically, UTMAs are now taxed according to trust rates, which ramp up very quickly. However, there is good news in that the first $2,100 of capital gains and dividends are income-tax free. Therefore, it makes sense to take advantage of this part of the Income Tax Rules. Specifically, you should look to harvest at least $2,100 in Capital Gains each year, less whatever dividends were realized. Meaning, if you have appreciated investments, such as a stock, mutual fund, or ETF, consider selling enough to realize $2,100 in Capital Gains. Then, if you like the Investment, you can re-purchase it right away, thus establishing a higher basis, which will reduce your Income Taxes later. If for whatever reason, your income will be markedly lower than in previous years, you may want to consider realizing Capital Gains as your income tax rate could be zero. This will require careful planning as your realized capital gains will increase your overall income. However, a zero percent tax rate is pretty low, so if at all possible, you should take advantage if the opportunity presents itself. For those in transition, pilots transitioning from Active Duty to an airline slot come to mind, your income will likely be low in the first year. 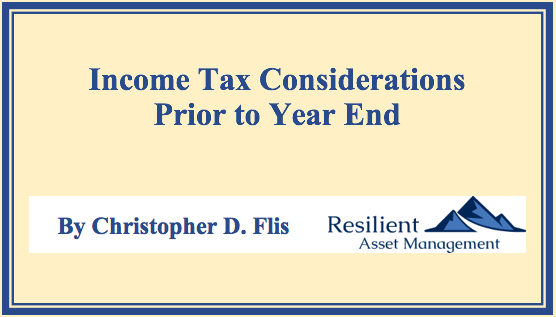 This is an ideal time to take advantage of the planning opportunities afforded those in the lower tax brackets. The zero percent capital gains rate is one such opportunity. There you have it - I don't claim this list is exhaustive. I do claim, however, that everyone should take a look at their situation to see if there are any Income Tax efficiencies to be gained - you may be surprised, and your wallet may be a bit more padded too. If you are unsure about how to go about utilizing any of the suggested strategies, please consult your financial planner of tax professional.